In just a few months from now, the Government will be launching its new welfare-to-work scheme, the Work and Health Programme. The scheme is intended to provide specialised employment support for both people with disabilities and the long-term unemployed, but the Government’s expectation is that the majority of those referred to the Programme will be those who are classed as disabled. This being the case, and to coincide with UK Employability Day, we thought it would be an opportune moment to combine own Labour Market Intelligence with data from the Labour Force Survey to give some insight into the numbers of people with disabilities currently at work across the country, looking at what jobs they are employed in, and which industries employ the most disabled people. Let’s begin by noting the numbers of people with disabilities currently working in Britain. Out of a total workforce of around 29.8 million, the number classified as disabled (as defined by the 2010 Equality Act) totals around 3.3 million, or approximately 11% of the total work force. This is clearly a significant proportion of the British workforce, but it leads to our second question, which is what jobs are they actually employed in? Most of the jobs in the second of these graphs are some of the biggest employing occupations in the country, and so it is perhaps unsurprising that they would include significant numbers of people with disabilities working in them. But the first graph throws up at least one very interesting observation. It is noticeable that there are a couple of occupations that are ordinarily self-employed (artists (19%) and authors (18.4%)). On the positive side, what this might indicate is that there is a good degree of self-sufficiency amongst people with disabilities. However, it might also indicate – although this is nothing more than a suggestion – that people with disabilities are finding it difficult to enter the full-time labour market and so end up working for themselves. As you can see, the workforce in some industries includes a significant number of people with disabilities. For instance, agriculture, forestry and fishing (15%); other service activities (14%); real estate activities (13%); administrative and support service activities (13%); and human health and social work activities (13%). At the other end of the spectrum, sectors such as information and communication (8%); and financial and insurance activities (8%) employ proportionately few. 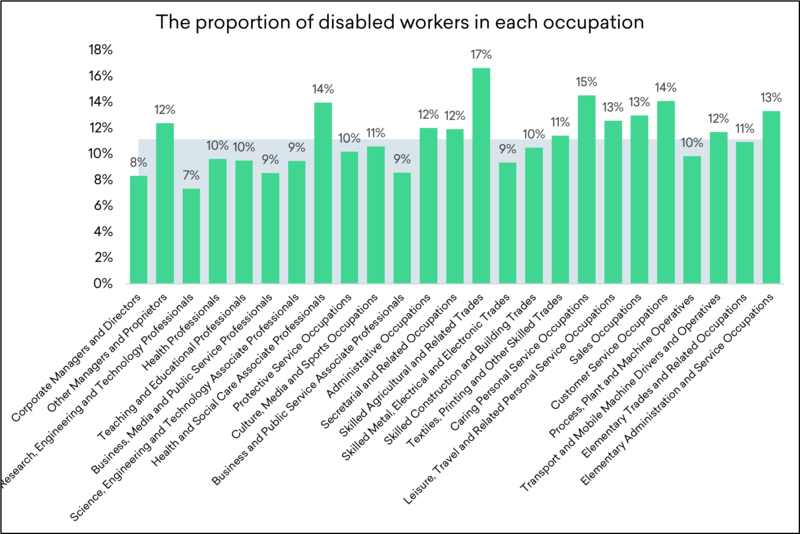 As with occupations, the industries in the second graph tend to be those that are the biggest all round employers, and so the fact that they employ significant numbers of people with disabilities is not particularly surprising. However, the data in the first graph is interesting, as it shows that there are some quite niche sectors – manufacture of ceramic tiles and flags; and artistic creation, for instance – where a large proportion of the workforce have a disability. The data we have presented above shows clearly that the disabled workforce makes up a significant part of the national economy. It also shows that there are many occupations and industries where representation is far higher than the national average – including in some self-employed jobs and some fairly niche sectors. With the Work and Health Programme in mind, what this can begin to do is to open up a few questions in the minds of those service providers who are awarded the contracts to run the Programme. For example, where are there the likely pinch points likely to be as the labour market tightens up? Might the occupations and industries that are currently employing fewer disabled people than others provide opportunities in the future? Are those occupations and industries that are currently employing significant numbers of people with disabilities set to grow over the next few years, and if so, does this present us with opportunities? As Scott Parkin noted: “This data shows that there are many disabled people in a range of occupations but there is much work to be done to close the disability gap. One way of doing that is to help employers gain more confidence in how to support disabled people and people with health conditions and help them understand that, in many cases, it often takes just a few, seemingly small adjustments. Gareth Parry, CEO Remploy said "This report highlights both the diverse career opportunities that are open to disabled people across the UK today, and the challenges that remain in opening up specific sectors and roles to all. "The data shows that disabled people are underrepresented in important growth sectors of our economy such as IT, communications and financial services. The recent announcement of the Disability Confident sector leaders group is welcome, encouraging the sharing of best practice within sectors. We should be doing more to equip businesses to build their internal capacity and support their employees with a disability or health condition. Remploy is working on a number of initiatives in this area. "The Work and Health Programme will have an important role to play. However, it's also important that disabled people who are already in work, and those who acquire a disability or health condition during their working life, can access effective support. Programmes such as the Access to Work Workplace Mental Health Support Service, which offers free support for those struggling to remain in work because of their mental health condition, and high quality occupational health provision, can make a real difference in helping people to sustain employment and progress in their career." Tom Bromwich, Operations Director, Pluss said “This is a most interesting and welcome piece of research that is close to Pluss’ heart. Pluss’ vision is to inspire people of all abilities to achieve a career, and our first principle is always to understand what the job seekers aspirations are in respect of work and find the most suitable job match. “However we do know that many employers still have concerns and a lack of confidence when it comes to employing people with disabilities. This is mainly because they are worried about doing the right thing or don’t know quite how to go about it.